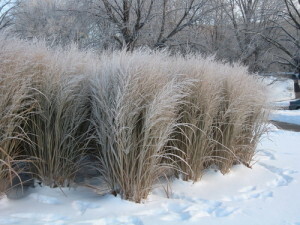 Each year, the Perennial Plant Association (PPA) names an outstanding plant its “Perennial of the Year.” The selection for 2014 is Panicum virgatum ‘Northwind’, an ornamental grass that was a runner-up in 2012. This is one of the first PPA winners in recent history that I have not personally grown and used in landscapes, so I cannot address it’s attributes first-hand. I can vouch for other Panicums – for example, I use ‘Shenandoah’ very regularly — and the stated virtues of Northwind are impressive. 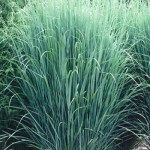 A North American native, P. virgatum ‘Northwind’ is hearty in much of the eastern United States. 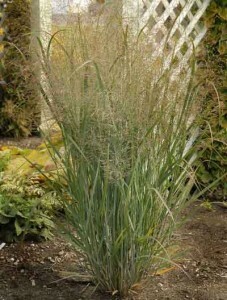 It is a stately Panicum, reaching 4-5’ tall (6’ in flower) and 2-3’ wide. A key attribute is that the plant retains its straight upright habit even through winter. 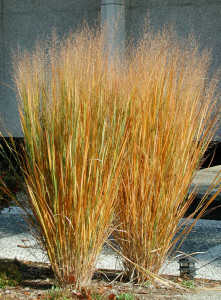 It provides color through the seasons – attractive olive- to blue-green foliage in summer (photo top left: Plant Delights Nursery) that turns golden yellow in fall, and produces the typical Panicum airy flower panicles – these appear yellow in late summer, turning beige into fall and winter. Panicums are lovely in masses and provide both a nice facer for evergreen trees and a backdrop with contrast for perennials and small shrubs. Because of its stature, Northwind also is nicely used as a specimen – vertical accent. Like other Panicums, Northwind thrives in part to full sun, is reliably deer resistant, and rarely is impacted by insects or disease. Plants are cut back to the ground in early spring, and clumps can be divided every few years.